Yes, the problem is as bad as we feared. As Brooks et al. point out, China imported about 45 percent of the world's plastic waste from 1992 until recently. Add Hong Kong, which ultimately sent most of its plastics imports into China, and the figure reaches more than 72 percent of global waste plastics. Even with this ready market for post-consumer plastics, we were only recycling 9 percent of the international plastics burden. We will have to find or create new markets for 111 million metric tons of plastic by 2030 to avoid sending that waste to landfills or, worse, the oceans. We'll need the cooperation of the packaging industry to limit the environmental impacts of the ban. While creating new recycling markets is a vital part of the solution to these economic changes, we can solve future problems by limiting virgin production at the source. Packaging manufacturers will have to be part of this solution; their products make up 40 percent of the European Union's plastic output, more than any other sector. The Chinese plastics ban could tilt the scale in favor of compostable packaging rather that recyclable plastics. While compostable plastics don't create much new value as they biodegrade, they also don't depend on a shrinking market for sustainable disposal. Changes to the recycling stream will take place both locally and globally. Plastics recovery occurs locally, and every community is struggling to find its own solutions to new vacancies in end-markets. But without a global framework, local changes might not make enough of a difference. The authors of the Science Advances study call for an international agreement to restrict plastics management and encourage sustainability. Nations share the ocean's resources, after all, and we're all contributing to the 4 to 12 million metric tons of plastic pollution that land there each year. Meanwhile, there's a vacuum in domestic plastics recycling for high-income countries. This represents an opportunity for homegrown entrepreneurs to fill the niche and build the plastics recycling infrastructure of tomorrow. The trouble is, new end markets will be too late for the bales of plastic that are being stockpiled as we speak. The Science Advances study only adds to the urgent necessity of addressing these challenges. The solutions are up to us. Brooks, Amy, Shunli Wang and Jenna Jambeck. 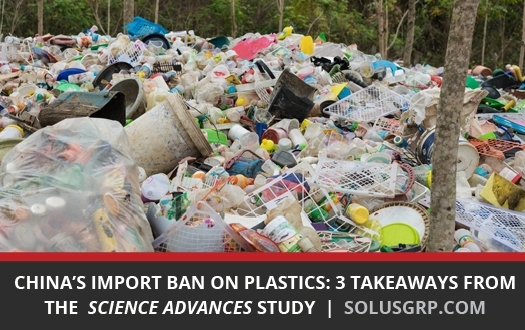 "The Chinese import ban and its impact on global plastic waste trade." ScienceMag. American Association for the Advancement of Science, 20 June 2018. Web. 27 June 2018. Szaky, Tom. "Compostable vs. recyclable: Which is better?" PackagingDigest. UBM Canon, 4 Apr. 2012. Web. 27 June 2018.